Sprigs of Rosemary: Holy Moly! 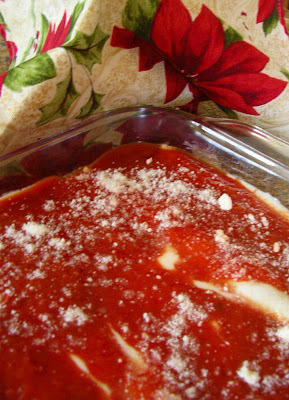 It's Christmas Cannelloni! The crepe making (as opposed to crepe hanging) really was a fun job, with a little help from some Christmas music cranked up. The first crepe is always a mess – it’s just for practice as Julia says. And once you get the heat just right and your rhythm going, you’re a one-man assembly line. Ethel without Lucy maybe. If you’re interested in making the crepes, go here. Otherwise, just buy the shells. But I have to warn you, they won’t be as good. The crepes are rich and tender and the perfect envelope for the ground beef, chicken liver and spinach ensemble. And the two different colored, and flavored, sauces were just the right finish. A little extra cheese, a little extra butter for browning and the dish is complete. Very Christmassy. The beauty of the whole dish was, for me, that it could all be done ahead of time, no last minute fussing to get everything to the table, which meant more time for visiting. A good swap of time. And spending time with family is the best part of Christmas. The food comes second. Submitted by Mrs. Edward A. Montgomery, Jr.
Preheat oven to 350. Butter (or spray) two 13 x 9 pans, preferably glass. Heat oil in a large skillet and cook onion and garlic over moderate heat for 7 – 8 minutes, until soft, not browned. Add spinach and cook for another five minutes. When all of the mixture is gone, transfer to a large bowl. Melt half the butter in the pan and add the chuck, browning lightly and stirring constantly to break up the meat. Add to bowl. Melt the rest of the butter and add the chicken livers to the pan and cook until lightly browned outside and pink inside. Chop the livers coarsely and add to the bowl. Add Parmesan, cream, eggs and herbs and stir all together until thoroughly blended. Place about 2 tablespoons filling down the middle of a crepe, fold the edges over the middle and place seam side down in prepared casserole. For Béchamel sauce: Melt the butter over moderate heat, add the flour, then slowly add the milk and cream. Whisk it together and bring it to a low boil, then turn down to a simmer until sauce coats the wires of the whisk. For Tomato Sauce: Mix the herbs into the plan sauce. Or just use jarred spaghetti sauce, with very little or mild seasoning. To assemble: Pour the Béchamel sauce evenly over the filled crepes. Then distribute the tomato sauce evenly over all, too. Sprinkle with Parmesan, and dot with butter. Bake uncovered for about 30 minutes. Slide under the broiler, if you want, for a few minutes to brown the top. So much fun making Crepes! and like you said the first one is just for practice :) Happy New Year!